Really looking forward to this album. Spacey and tech-ish. Creative and uplifting. Another gem from System 7.
amazing album this one. these guys are gods. Yep, happy I got this one. PositiveNoise, The Mind Boggle, At Last, E-Fusio, Dolphin Smack, I Seem To Be A Verb, and Plasmatic Park, are really great tracks ! ! Funky Gong starts nicely, and Berimbau has some good parts, but to be honest I would enjoy the album as an album much more without those two, or maybe if they were a bit more interesting. All in all, 'UP' is definitely recommended ! I love Berimbau- contagious groove. System 7 are amazing. They have always innovated and changed with the time and got the respect of all the best musicians around them and worked with all the techno godfathers. 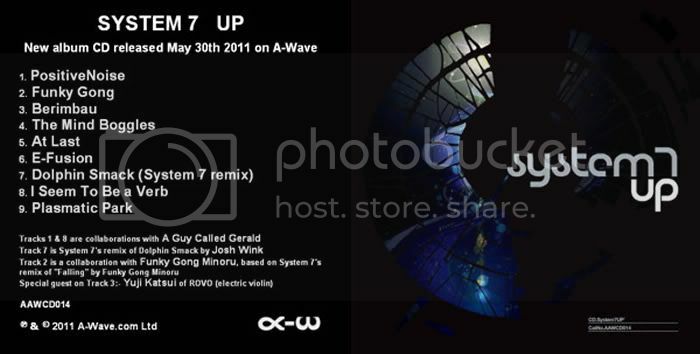 Check out the double album as 777 – System 7.3 Fire + Water. It's featuring ppl like Laurent Garnier, Derrick May, Greg Hunter, Youth, Juno Reactor, Total Eclipse, Micky Mann and others. Their live act also rocks. Steve Hillage- Rainbow Dome Musick. Two long pieces of Moog ambient released on record via Virgin in 1979 (!!!). Talking about pioneering. I don't know, at some point it just gets a bit too monotonous for my taste. But as I said, I really like the rest of the album. My favorites are E-Fusion, At Last, Dolphin Smack, and I Seem To Be A Verb. But PositiveNoise, The Mind Boggle and Plasmatic Park are great too ! The Mind Boggle reminds me of some old Underworld stuff. . .